The most recent episode of Game of Thrones, “Beyond the Wall,” was one of the most divisive in recent memory. Much of that was because of the highly questionable timeline linking the group in the North with Daenerys, who was much further South. In a new interview Alan Taylor, a veteran Game of Thrones director who came back to do “Beyond the Wall,” discussed the timeline and admitted it didn’t quite work. We were aware that timing was getting a little hazy. We’ve got Gendry running back, ravens flying a certain distance, dragons having to fly back a certain distance…In terms of the emotional experience, [Jon and company] sort of spent one dark night on the island in terms of storytelling moments. We tried to hedge it a little bit with the eternal twilight up there north of The Wall. I think there was some effort to fudge the timeline a little bit by not declaring exactly how long we were there. I think that worked for some people, for other people it didn’t. They seemed to be very concerned about how fast a raven can fly but there’s a thing called plausible impossibilities, which is what you try to achieve, rather than impossible plausibilities. So I think we were straining plausibility a little bit, but I hope the story’s momentum carries over some of that stuff. Hey, at least he admits it. There are probably people out there who would vehemently defend the timeline no matter what (and Reddit’s already figured out how it could technically work). But Taylor’s reasoning at least feels honest. Either you were entertained and didn’t care, do care and were annoyed, or are somewhere in between. By the way, this whole season has been riddled with these Portal-esque jumps in time and place. Jon to Dragonstone. Arya to Winterfell, Tyrion to King’s Landing, etc. 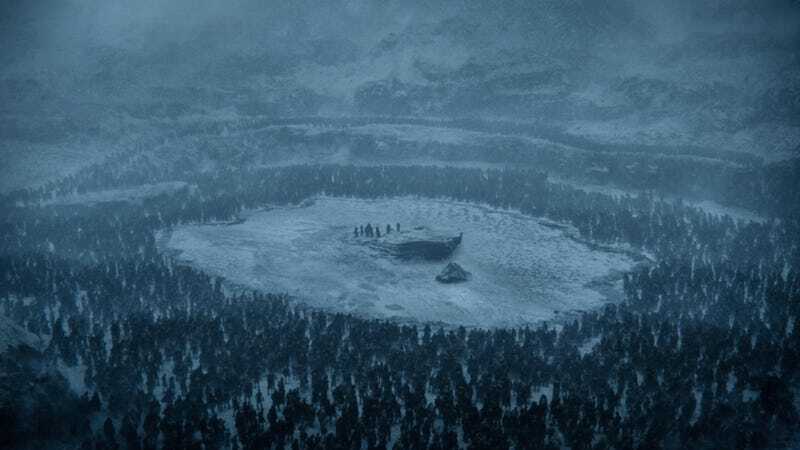 This just so happens to be the most egregious because of the freezing men sitting on a cold stump waiting for a dragon to save them from thousands of miles away. The seventh season of Game of Thrones ends Sunday.